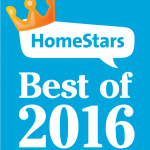 You Are Here: Home » Company Annoucements » Best Of Homestars 2016! We are pleased to announce that Woodopolis has won the Best of 2016 Reward on Homestars.com. We want thank all the customers that took their time and vote for us.